George Stroumboulopoulos' CNN promo is bizarre. 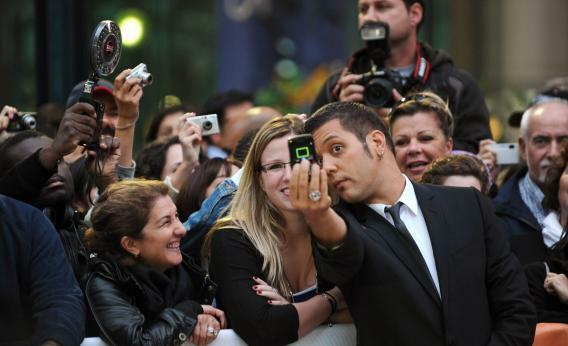 Television personality George Stroumboulopoulos attends the premiere of Score: A Hockey Musical during the 35th Toronto International Film Festival on Sept. 9, 2010. Stroumboulopoulos, not to be confused with another TV personality of Greek descent named George, will be hosting a celebrity talk show on CNN. Look, it’s been a long week, and the Strategic News Reserve has basically run dry in D.C. Allow me to indulge in the strangest TV promo I’ve ever seen, if TV promos are intended to make viewers want to watch shows. It’s for Stroumboulopoulos, a new chat show on CNN hosted by the aggressively hip Canadian journalist. Spot the problem. Stroumboulopoulos, as any Canadian or Canadaphile (i.e., me) knows, conducts solid celebrity interviews for The Hour. They’re of a style that we don’t really have in the U.S.—long, no sidekicks, sometimes no news hooks. But the footage of those interviews doesn’t belong to CNN. So instead, CNN realizes that there is another, more famous person of Greek descent (one whose return to This Week after the Amanpour debacle probably helped CNN score Jake Tapper), and conducts man-on-the-street interviews asking people about him. People with similar-sounding names are different people, it turns out. Was there no time to get celebrities to say how much they liked talking to the guy? Would that have violated some ethical boundaries? Because celebrities like the guy!